Creating clay dinnerware is fun and simple. It requires you to have clay as well as other items, which are readily available in most homes. Some of these items include a sponge, plastic knife, needles, a pair of scissors, a kitchen timer, pencils and some newspaper. Other tools that may not be readily available in the home include a clay cutter, a mold in the required shape, textured mold, slab rollers or a rolling pin, a trimming tool, ceramic paint, glaze and a chamois. 1.Make a model smaller than the drape mold using the newspaper. Measure a slab of clay about half an inch in width. It should be bigger than the plate size. 2.Using the newspaper model, cut out the shape of the plate from the clay slab. A kids baking set that is easier to use will help the kids to stay involved. 3.Place the clay plate on top of the textured mold and press it down using a roller. Press from the centre going out. Slant the rims of the plate on the roller. You can press on decorative objects like beads, glass or leaves if you desire. 4.Transfer the plate to the drape mold and press it gently until the set up is evenly distributed and the desired shape achieved. Flatten the bottom using the slab roller and move the coil around to get the desired fit. Place it on a flat surface to test the evenness. 5.Harden and seal the coil to the plate using a rotating pedal wheel. While the wheel is turning, press the edge of the coil and use the trimming tool to trim and alter the coil foot. Raise it slightly to make it level and give it good support. 6.Use a wet sponge and a chamois to shape and smooth the rims of the plate. Make sure the rims appear even and well finished. 7.Place the plates in the oven until completely dry. Use the kitchen timer to keep a close watch and avoid over baking the plates. 8.Use the ceramic paint to adorn the plates with a design of your choice. Kid’s dinnerware can be more colorful. Encourage the kids to pick colors they like for each of their plates. Use non-toxic clear glaze for a smooth finish and return it to the oven to set the glaze. Making household items at home can be both cost effective and fun. 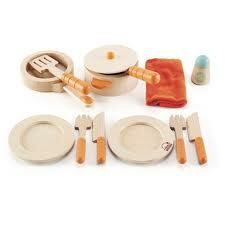 A clay art dinner set is an ideal present; or you can create one for personal use. You can create dinnerware that suits your taste, while spending only a small amount compared to if you would have to buy it. Making kids dinnerware is a fun way to involve the whole family in a project.